From the salty marshes and ocean shoreline of the Georgia coast to the majestic skyline of the Blue Ridge Mountains, 12 Georgia communities have been selected as the official Host Venues for the sixth annual Tour de Georgia, scheduled April 21-27, 2008. The introduction of these Host Venues was announced today by Lt. Governor Casey Cagle at a press conference at Childrens Healthcare of Atlanta at Scottish Rite. Cagle also recognized the Aflac Cancer Center and Blood Disorders Service of Childrens as the new beneficiary for the Tour next year. "Today is an exciting day. As we entered into this sixth season of the Tour de Georgia, we promised to revitalize the event and we are well on our way. With the selection of our 12 Host Venues, including two mountain stages and the addition of the Team Time Trial, we are taking the steps necessary to continue strengthening the Tour de Georgia- ensuring it remains North America's premier cycling race. This April, we will welcome the world to Georgia," said Lt. Governor Casey Cagle. "The addition of the AFLAC Cancer Center at Children's Healthcare as a beneficiary is a very important move for the Tour. This event is not just a bike race. The heart of this race will be about giving back." Five new communities will host the Tour for the first time  Road Atlanta/Braselton, Statesboro, Suwanee/Gwinnett Co., Tybee Island, and Washington. Savannah hosted the overall start of the inaugural Tour de Georgia in 2003. Other returning Host Venues include Atlanta (2003, 2007), Augusta (2005, 2006), Blairsville (2004-2006), Brasstown Bald Mountain/Towns Co. (2004-2007), Dahlonega (2004-2006), and Gainesville (2003, 2005). Stage 1: Monday, April 21  Tybee Island, Ga. to Savannah, Ga. 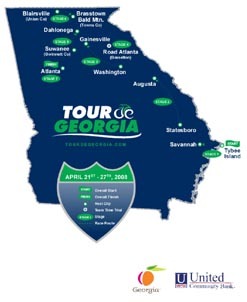 Stage 2: Tuesday, April 22  Statesboro, Ga. to Augusta, Ga. Stage 3: Wednesday, April 23  Washington, Ga. to Gainesville, Ga. Stage 5: Friday, April 25  Suwanee/Gwinnett Co., Ga. to Dahlonega., Ga. Stage 6: Saturday, April 26  Blairsville/Union Co., Ga. to Brasstown Bald Mtn/Towns County, Ga.
Brasstown Bald Mountain, property of the National Forest Service that is the highest peak in Georgia (4,784 feet), has become the signature "Queen Stage" of the Tour, showcasing the mountain region of the state. Road Atlanta, a multi-purpose motor sports facility situated on 750 park-like acres in Northeast Georgia, will host the first Team Time Trial of the Tour de Georgia. The individual time trial discipline has been part of the Tour since 2004. The exciting and highly anticipated Team Time Trial will replace the ITT this year in Georgia. It is incorporated into stage racing occasionally, and was last part of the Tour de France in 2005. This "race of truth" for teams was reintroduced on American soil in 2007 at the International Tour de 'Toona, and had not been staged since the 1986 World Championships in Colorado Springs, Colorado. The Tour de Georgia will return for a second consecutive campaign as a seven-day professional race and maintains its position on the international cycling calendar as a major tune-up for July's Tour de France. The Tour de Georgia continues to be the longest weeklong stage race in North America with over 650 miles of scenic byways and highways across the state. It is also one of the highest ranked stage races outside of Europe with a 2.HC rating from the Union Cycliste Internationale (international governing body of cycling) and is one of the top races on the USA Cycling Professional Tour. "The Tour de Georgia is a race I love because of the amazing fans and how well it fits in with my racing schedule. Being the best young rider in 2006 was great, but winning the whole race in 2007 was the highlight of my racing career. I am always asking my directors to do more races in the U.S. and I plan to be back again in April," said 2007 Tour de Georgia champion Janez Brajkovic, racing in 2008 for the Astana Pro Cycling Team. The 2007 Tour included 120 athletes from 23 countries. Fifteen professional cycling teams from around the world, each with eight athletes, will be extended special invitations to participate in the event by Medalist Sports. By January 2008, an announcement is expected to describe the details of the projected 650-mile route and the top teams accepting invitations. "The continued success of Tour de Georgia generates positive value for local communities and the state and unparalleled enthusiasm for hundreds of thousands of spectators who travel to these communities for this springtime sports tradition. We are proud that the Tour de Georgia offers a prestigious level of competition for world-class athletes, and an opportunity for many of our U.S. based to perform on home soil," Elizabeth Dewberry, the executive director for the 2008 Tour de Georgia. Since 2003 the Tour de Georgia has attracted 2.8 million spectators and generated over $148 million in economic impact for the state of Georgia. The event aligned with the Georgia Cancer Coalition in its first six years, to raise both awareness and revenue across the state. In 2008 the official local beneficiary will be with the Aflac Cancer Center and Blood Disorders Service of Children's. "It is virtually impossible to explain how important events like Tour de Georgia are to the children of Atlanta and the surrounding southeastern region," stated Dr. William G. Woods, Director of the Aflac Cancer Center and Blood Disorders Service of Childrens. "Philanthropic events and organizations make it possible for our staff of physicians and nurses to fight pediatric cancer and blood disorders and get kids back to being kids." Details for each of the seven stages, including route details, maps, and recommended viewing locations, are being planned by Medalist Sports. All information will be posted on the official website, www.tourdegeorgia.com. The new website, created by AVF Creations, was launched in conjunction with the press conference today. This website will be updated weekly with travel information, volunteer opportunities and sponsor promotions for the event. *The International Tour de 'Toona in Pennsylvania held at 10.6-mile Team Time Trial in 2007. The Tour de Georgia is North Americas premier, professional cycling event and rolling festival of community activities. The Tour was first held in 2003 and has become a spring tradition with a varying route of over 650 miles of racing. Over 2.8 million spectators have traveled to Georgia to watch the event in the past five years, and direct economic impact has totaled over $148 million. The event is sanctioned by the Union Cycliste Internationale (2.HC ranking), and is part of the USA Cycling Professional Tour USA Cycling, Inc., making the event one of the top stage races for elite athletes around the world. The Tour de Georgia is operated by a Board of Directors and managed by Medalist Sports (ww.medalistsports.com). Route maps, host venue information, merchandise offerings and sponsor news will soon be available for the 2008 event at the official website, www.tourdegeorgia.com. Medalist Sports is a full-service international sports marketing company. Medalist Sports specializes in the planning, promotion and management of multi-day, multi-jurisdiction sports and special events. The Medalist Sports team has experience in all facets of the successful management and promotion of world-class sporting events. Clients and event experience include the Tour de Georgia, Amgen Tour of California, Tour of Missouri, USA Cycling Professional Championships and the Lance Armstrong Foundation/LiveStrong Challenge Series. Medalist Sports' headquarters are located south of metro Atlanta at P.O. Box 415, Tyrone, GA 30290. The company website is www.medalistsports.com. Recognized by the U.S. Olympic Committee and the Union Cycliste Internationale, USA Cycling promotes American cycling through its 60,000 members and 2,500 annual events. USA Cycling associations include the BMX Association (BMX), National Off-Road Bicycle Association (mountain bike), U.S. Cycling Federation (road/track), the National Collegiate Cycling Association and the U.S. Professional Racing Organization professional men's road). USA Cycling is the license holder for the USA Cycling Professional Individual Time Trial Championships and USA Cycling Professional Road Race Championships. For more information visit www.usacycling.org, or contact USA Cycling Director of Communications, Andy Lee at 719-866-4867. The Aflac Cancer Center and Blood Disorders Service of Children's Healthcare of Atlanta is a national leader among childhood cancer, hematology, and blood and marrow transplant programs, serving infants to young adults. Recognized as one of the top five pediatric cancer centers in the country by Child magazine, the Aflac Cancer Center treats more than 325 new cancer patients each year and follows more than 2,000 patients with sickle cell disease, hemophilia and other blood disorders. The Aflac Cancer Center is one of many programs at Children's committed to enhancing the lives of children through excellence in patient care, research and education. Children's, one of the top three pediatric healthcare systems in the country, is a not-for-profit organization that benefits from the generous philanthropic and volunteer support of our community. Visit www.aflaccancercenter.org or call 404-250-KIDS for more information.